Beaches Family Resorts is for families, friends, couples, and singles and especially you. Beaches Resorts Beaches Turks & Caicos, and Beaches Negril, and Beaches Ocho Rios. Beaches Resorts Voted World's Best Family All-Inclusive year after year. Beaches Resorts continues in the Sandals Resorts tradition of providing the most comprenhensive vacation experience ever. You're free to enjoy the best of everything. And everything's included from fabulous gourmet meals, anytime snacks and premium brand drinks, to exciting land and watersports, luxurious accomodations, even tipping. So indulge in every imaginable whim as freely as you choose, as often as you want. Because when it comes to providing the ultimate vacation, only Beaches Resorts could follow in Sandals Resorts footsteps. Big Bird* joins everyone's favorite furry friends on stage for a fun-filled show full of singing and dancing-sure to delight the whole family! There isn't a kid in the world who doesn't adore Sesame Street®. 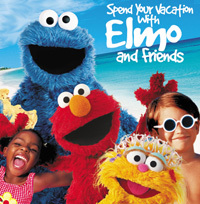 And now parents can give kids the extraordinary gift of sharing their vacation with Elmo and friends. Join the colorful cast of characters including Elmo, Cookie Monster, Grover, Zoe, Bert and Ernie, Abby Cadabby, the Count and coming this Fall, BIG BIRD! Enjoy the Caribbean Adventure with Sesame Street® with a full schedule of events. Beaches Resorts and Sesame Street's Elmo, Zoe, Cookie Monster and Grover will appear daily at Beaches Resorts' 4 Caribbean properties. Dream of an unspoiled paradise where time knows no limits. A rare place where sophistication and fun coexist in perfect harmony. A private retreat where the Caribbean sun warms your body and the white-sand beach soothes your soul. It's not a dream, it's a dream come true. It's Beaches Resorts, a new all-inclusive concept for everyone brought to you by Sandals Resorts. For years, couples have been wanting to share the Sandals Resorts experience with their families and friends. Now with the introduction of Beaches Resorts, they can. Since Beaches Resorts is part of the Sandals Resorts family, you can expect the same uncompromising level of luxury and dedicated standards of service that have become the hallmark of every Sandals Resort. Best of all, Beaches Resorts is a paradise for everyone, where everything is included. From the most luxurious accommodations to world-class gourmet dining, no detail has been left out - and no one has been forgotten. Singles. Couples. Families. Everyone is welcome at Beaches Resorts. And Beaches Resorts is a welcome change from the ordinary. This new concept uniquely fuses extravagant indulgence with the natural beauty and warmth of the Caribbean. Singles will never feel out of place - because at Beaches Resorts no one is a stranger for very long. For couples, from honeymooners to those who want a romantic getaway. Beaches Resorts offers quiet spots where they can discover the true passions of romance. For families, there will be special times spent together, yet adults will enjoy a tranquil vacation while their kids enjoy a vacation from their parents. All in all, Beaches Resorts is the new all-inclusive that's all things to all people. Jamaica is the top-ranked destination in the Caribbean and Negril is definitely the adventurous side of Jamaica. Beaches Negril is a brand new lavish resort situated on a 20-acre lushly landscaped site on the shore of Negril's renowned seven-mile beach. This exciting resort offers luxurious accommodations including true beachfront rooms and expansive suites. There are sensational restaurants including everything from Italian to entertaining Teppanykai-style cuisine. Toast the perfect vacation at two swim-up pool bars, sing along at our piano bar, or watch your favorite team at our state-of-the-art sports bar. There are three freshwater swimming pools to refresh your spirit, an impressive sports complex with tennis, volleyball and basketball courts, and fully-equipped fitness center. A full range of water sports is offered including water skiing and some of the best scuba diving in the Caribbean, Beaches Negril - for those with a taste for adventure. Beaches Negril has started an Appleton Day on Thursday in the Aqueduct. Guests are able to experiment with and enjoy Appleton Rum through mycology sessions combined with a fine display of culinary items for sampling made with Appleton Rum. This is very popular with the guests. Beaches Negril has diligently been working at getting the resort Green Globe Certified. As part of their efforts the resort has implemented the following: Every Friday the resort has a "No Straw Day" as part of the environmental awareness program. Sometimes you have to get away to get together. So get away to Ocho Rios, a place where lush mountains fall into the sparkling Caribbean Sea, waterfalls cascade into bubbling laughter, and each day is filled with a thousand delightful surprises. At this enchanting resort, rolling green fairways beckon, while tiered gardens overflow with abundant possibilities, and all the pleasures of paradise are as endless as its pristine beach. Golf green fees and transfers to the Sandals Golf & Country Club will be included. Children under the age of 16 must play golf with an adult. The newly revamped Beaches Ocho Rios presents a brand new look and all new experiences for the whole family. Tucked into the cliffs of the North Coast, this lively resort is perfect for families looking for the ultimate island getaway. The décor and accent colors of the newly redesigned rooms and suites reflect the dark, rich woods of the St. Ann Mountains and the sparkling, blue hues of the Caribbean Sea. Featuring solid mahogany king size beds, matching nightstands and writing desks, and turquoise-accented patio furniture, vibrant hues are blended with the handcrafted woods and natural marble to characterize the casual luxury of Beaches Ocho Rios. Now with larger, oversized rooms, suites, and family rooms, Beaches Ocho Rios also features more luxury so that families can feel comfortable. With large flat screen televisions, organic pattern area rugs and custom abstract art in all rooms and suites, families have an exquisite living space and luxury that make it hard to even leave the room. With some suites situated right along the beachfront, and others with spacious balconies, unparalleled views of the Caribbean Sea are endless. Rooms and suites are situated to provide an abundance of natural light and space, and create a sophisticated and relaxed ambiance for the entire family. 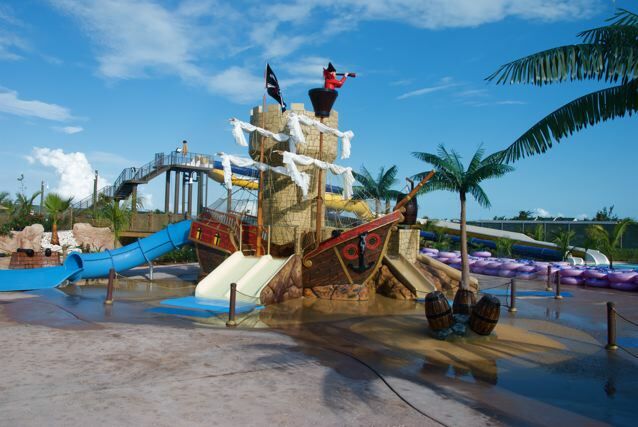 The new Pirates Island Water Park sits on an expansive 27,000 sq ft. area, featuring nine additional slides. There are six new kiddie slides, a Treasure Isle Aqua-Play area complete with water cannons and a treasure chest, a kid zone and zero entry kiddie pool completed with a misting crab, a squirting sea turtle and a splashing seahorse. 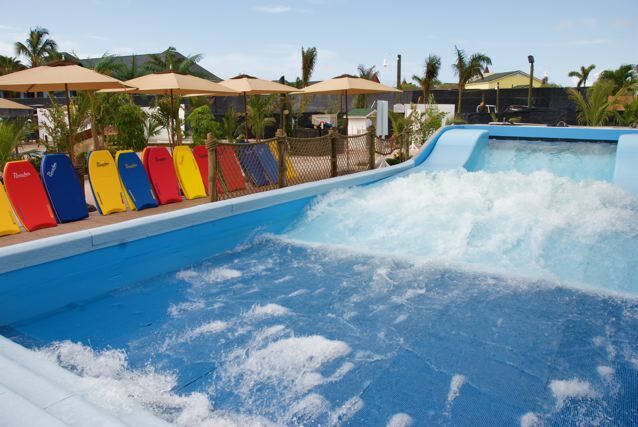 For the not-so-young but young at heart, the Water Park features a tube slide, a body slide and a speed slide. There is also a Water Crawl Cargo Net Aqua-Play Structure, complete with sea creature-themed stepping-stones including a starfish, an oyster shell and a nautilus shell made from soft-play resilient foam. There are now eleven slides in total. Beaches Turks & Caicos is located on the island of Providenciales, in the British Crown Colony of Turks & Caicos. Just over and hour from Miami, this exotic resort is an unspoiled, uncrowded paradise where marine life out numbers human beings. Beaches Turks & Caicos is nestled amid groves of palms and tropical foliage that fronts a 12 -mile stretch of pristine beach bordered by a natural reef. This resort includes true beachfront rooms as well as one and two-bedroom beachfront villas with fully equipped kitchens. At this tranquil resort, you can choose from four gourmet restaurants featuring the world's favorite cuisines prepared by innovative chefs. Other facilities include a lively piano bar as well as several bars including a swim-up pool bar. Water sports include sailing and the Caribbean's top-ranked snorkeling and scuba diving. Land sports include a lavish fitness center, day and night tennis, and basketball, to name a few Beaches Turks & Caicos - for those who prefer to separate themselves from the crowd. Beaches Turks & Caicos Resort & Spa in Providenciales, or "Provo" for short, expands this year to the tune of $75 million. The resort already was voted "Turks & Caicos Leading Resort" by more than a half a million travel agents worldwide. And now, a new Italian Seaside Village will feature a 12,000-square-foot pool with an expanded water park with wave pool, a fun new Kids Kamp facility for 6-to 12-year-olds with added arcade games, a hot new nightclub for parents, added retail space and three new gourment restaurants. And a big hit for families will be the 168 new family suites, with separate areas for parents and children. Mom and Dad can unwind with their own sitting room, private bath and Jacuzzi tub, while kids enjoy the fun of their very own bunk beds. - Beaches Turks & Caicos Resort & Spa added a new activity to its ever-growing list of watersports, turning a day or night on the water into a luxury cruise. The resort’s newly acquired custom-designed catamaran, the Kitty Katt, debuted the week of March 17th, offering exceptional features and amenities and delighting guests with up-close encounters with fascinating marine life. The new Kitty Katt is the only catamaran of its kind in the world, and was custom-designed for Beaches Resorts, especially with families in mind. Engineered to the highest safety standards, top features of the Kitty Katt include a spacious deck to grandly accommodate a number of guests; a fully stocked kitchen, where mouthwatering meals and snacks are prepared and served by professionally trained chefs; a kids soda and juice bar and kids buffet; space to accommodate special appearances by Sesame Street characters and a live video feed to plasma-TV monitors located right inside of one of the pontoons. The live-feed offers amazing up-close-and-personal underwater views of the deep blue sea and all its inhabitants. Best of all, the Kitty Katt comes complete with an eight-foot tube slide off the stern, so guests can splash down into the sparkling Caribbean Sea. Four other custom-designed catamarans will soon be delivered to select Sandals Resorts and Beaches Resorts locations in Negril and Montego Bay, Jamaica and Antigua. Guests can book their maiden voyage on the Kitty Katt through the resort’s Tour Desk. * Just over 1 hour from U.S.
Best Family Resort for Kids, Year After Year! "Best of the Caribbean" awards ceremony. Rainforest Game Center with pool tables, ping pong tables etc. ALL OFFERS AND/OR PROMOTIONS CAN BE CHANGED OR WITHDRAWN AT ANY TIME, WITHOUT NOTICE.